Ratha Saptami is dedicated to Lord Surya, the Hindu Sun God. 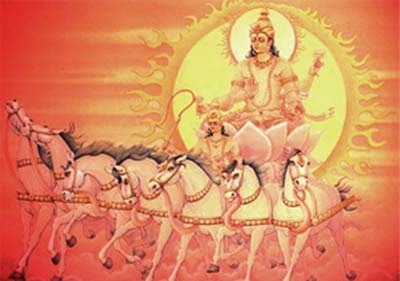 As per the tradition in Hinduism, Lord Surya is believed to ride a chariot driven by seven horses – this form is worshipped during Ratha Saptami puja and festival. Ratha Saptami 2019 date is February 12. The festival is of great importance at the Tirumala Tirupati Balaji Temple. It is said that the earth's inclination towards the sun is steepest on the Ratha Saptami day. Ratha Saptami is observed on the seventh day of Shukla Paksha, or waxing phase of moon, in the Magh Month (January – February) in a traditional Hindu lunar calendar. The day is of great significance in Maharashtra, Andhra Pradesh, Telangana, Karnataka and Tamil Nadu. In Orissa, the day is observed as Magha Saptami. In other regions the day is observed as Surya Jayanti. It is considered to be the most important saptami in a year. It is believed that in the Mahabharata, Bhishmacharya chose this day to leave his body and attain ‘moksha.’ It is also said that the earth's inclination towards the sun is steepest on the Ratha Saptami day. A kolam or rangoli of Lord Surya riding a chariot is made on the ground and worshipped in many places. Some people boil milk in earthen vessels on the day. Another important ritual on the day is taking bath using Erukku leaves. This is followed mainly in Tamil Nadu. The rituals observed on the day vary from region to region. Another unique ritual is taking bath by carrying a lamp on the head. A painting of Sun with seven chariots is made on the ground and worshipped in many places. Some people boil milk in earthen vessels in the courtyard. The rituals observed on the day vary from region to region. Special rituals are also held on the day at temples dedicated to Surya especially at Arasavalli and Konark. The day is of great significance in Tirupati Balaji Temple. One can witness, Lord Balaji on seven different Vahanas on the day. Interestingly, Ratha Saptami is also observed in the month of Margashirsha (December-January) by certain communities. It is also dedicated to Sun god and a fast is observed on this day. Taking bath at the time of sunrise is considered highly auspicious. This is observed largely in North India. How to observe Ratha Saptami Puja?